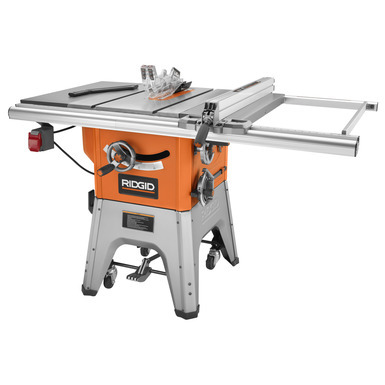 So you may be looking at buying the RIDGID 4512 and thinking to yourself that this table saw looks a bit familiar, and you would be right. It is very similar to the very good Craftsman 21833 10″ Contractor table saw. This saw represents amazing value for money. At the time of writing you can buy the Ridgid 4512 for $549 from Home Depot which is $22 more expensive than the Craftsman 21833 available from Sears so lets look at what you are getting for your money. The Ridgid 4512 is another heavyweight contractor table saw that weighs in at a hefty 267 lbs. Heavy saws usually mean less vibration and more stability. So if you don’t need to move the table saw from jobsite to jobsite then this may well be a good thing for you. The Ridgid 4512 also incorporates the same wheeled base that can be found on the Craftsman 21833. I really like this clever design. 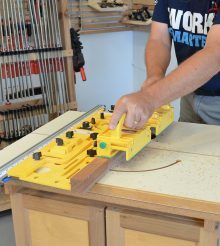 Using a foot lever the table saw can be raised onto its wheels to be easily moved about your workshop. This is great if space is at a premium in your workshop or garage. The RIDGID 4512 is supplied with a 10″, 40 tooth carbide tipped combination blade. 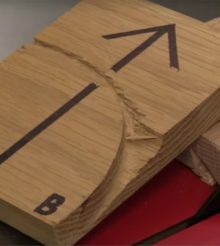 As with all table saws the blade supplied is OK for rough cutting, but you will notice a huge difference in the quality of cuts by buying a decent saw blade better suited to your needs. The saw has a standard 5/8″arbor so will accept any standard 10″ saw blade. The RIDGID 4512 has a pretty standard blade guard system, It consists of a plastic blade guard, riving knife and anti-kickback pawls. The riving knife has two positions. The high position is to be used with the blade guard and anti kickback pawls for through cuts and the low position where the riving knife is below the top of the blade and will allow you to make non through cuts and dado’s. The blade guard system can be added and removed without the use of tools. The riving knife can also be positioned without the use of tools. The Saw comes with a plastic push stick that mounts to the side of the saw. The RIDGID 4512 comes with an aluminium fence that runs on aluminium rails attached at both the front and back of saw. The fence runs easily on the rail and locks on both the front and back rail. It is secure with no flex and locks square to the blade. If you are unfortunate enough to have a saw where the fence is slightly out of alignment, follow the steps in the instructions to adjust and you shouldn’t have a problem. Problems do sometimes arise when you buy a new tool, but more often than not they can all be resolved with a bit of adjusting. The saw also comes with a very good miter gauge. the miter slots on the cast iron table are a standard 3/4″ x 3/8″ t-style slot giving you the option of either using the miter gauge supplied, or one of the many excellent after market miter gauges If you would prefer. The RIDGID 4512 has a very powerful 13 amp belt driven induction motor that spins at 3450 RPM. The motor is prewired for 110 volts, but can be rewired for 220 if this is what you have in your workshop. You will just need to follow the steps in the instruction manual to do this. RIDGID have given us a very good table saw here. 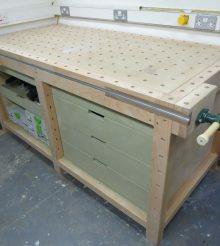 It is aimed perfectly at the weekend/semi-pro woodworker who doesn’t have the space or budget to justify a full blown cabinet or hybrid saw, but still wants a quality, good sized, cast iron table saw without breaking the bank. The belt driven induction motor will give you a quiet, smooth and powerful saw that will easily handle anything you choose to cut on it. I really like the wheeled base (the same one that can be found on the Craftsman 21833) a simple press of the foot lever deploys the wheels so the saw can easily be moved around your workshop.